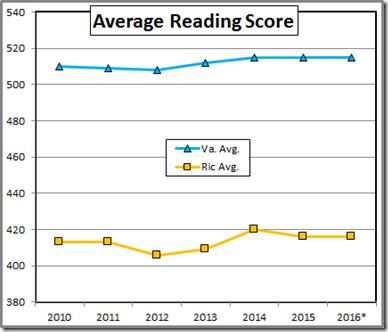 RPS has posted the 2016 SAT scores. 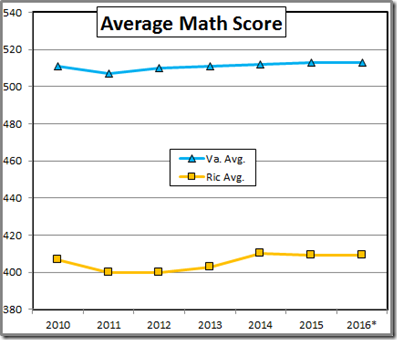 Caveat: The College Board has again jiggled the tests and the scoring so the “new” (2016) scores are not directly comparable to the “old” scores. They renamed the tests, too. 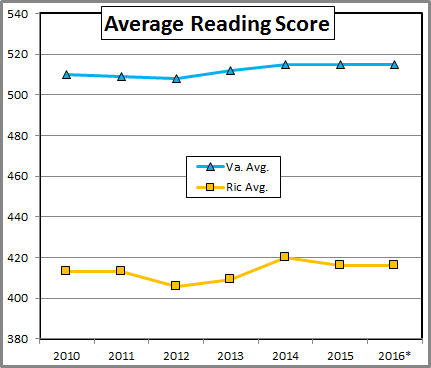 Further Caveat: RPS reports scores of “college bound” students. 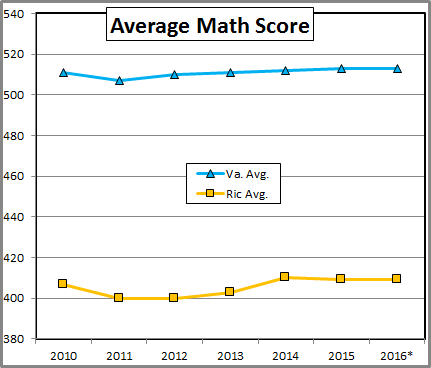 That generally runs a few points higher than the average for all SAT takers. That said, it looks like the new system left the Richmond and State averages about where they were. 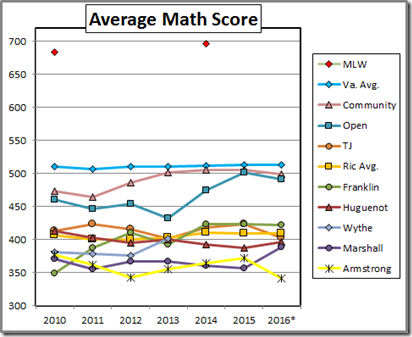 As to the school averages, except for some slight bumps at Franklin, Huguenot, and Marshall on the reading test and at Marshall on math, and a drop in the Armstrong math average, the “new” scores don’t look much different than the “old,” 2015 numbers. The pairs of red points in the vicinity of 700 on the graphs are the only Maggie Walker data I have. 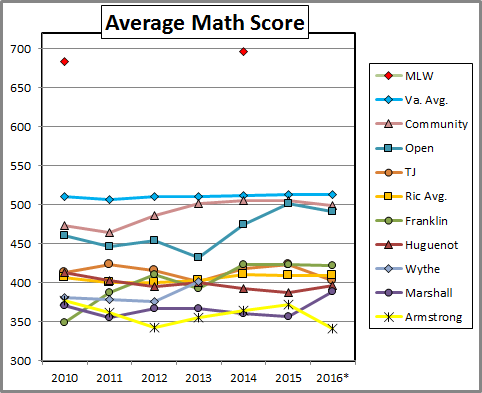 Of course, Walker is not a Richmond Public School, albeit Richmond included Walker scores in the Richmond average until they got caught. 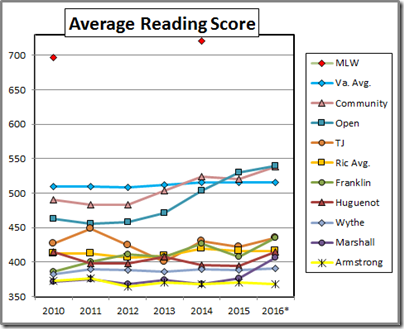 For some context as to the RPS scores, the 25th percentile of the 2014 Longwood entering class was 470 reading, 460 math, well under the state averages. 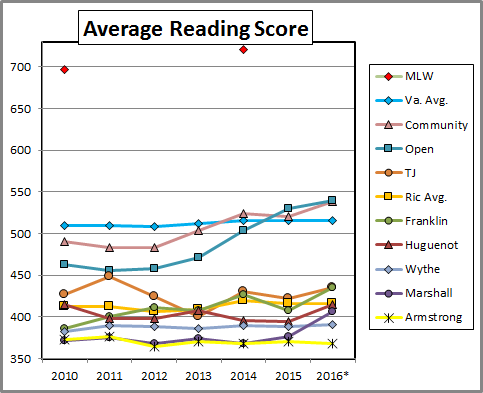 As you see, Richmond’s two best high schools topped those numbers but the others fell far short.